← Oatmeal Peanut Butter Cups: Breakfast or Dessert? 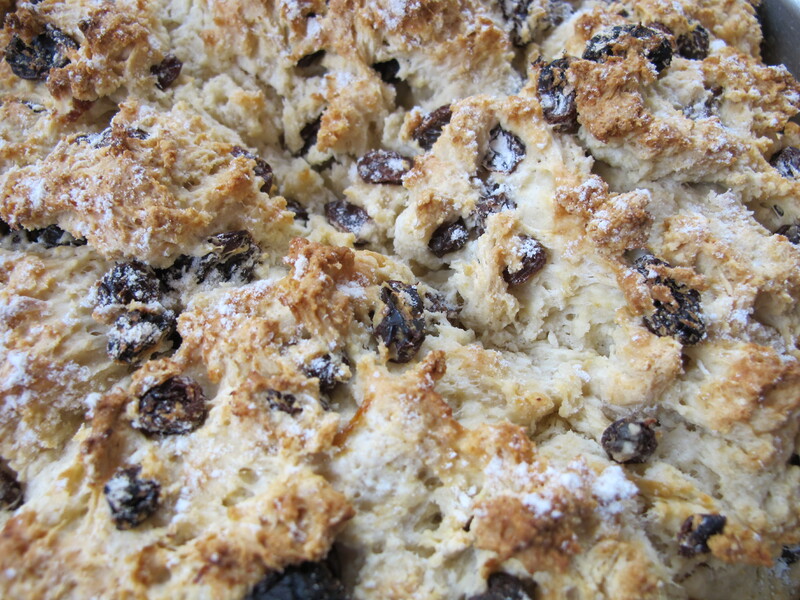 To be honest, before I tried Irish soda bread I was of the mind that raisins don’t belong in any baked goods. I’m fine with raisins in my cereal or granola, but it is so upsetting to bite into what you think is a chocolate chip cookie, only to discover it’s an oatmeal raisin one. Tough life, I know. 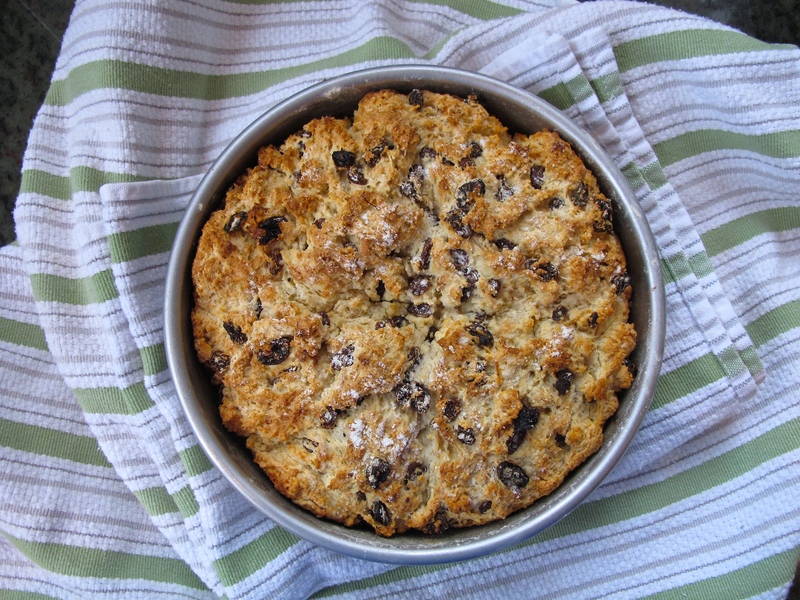 But when my friend Cat’s mom made Irish soda bread for St. Patrick’s Day a few years ago, I decided that I would make an exception to the rule — because raisins definitely deserve a place in this bread. It’s hearty and great when toasted with lots of butter topped on it (really, what isn’t?). I got this recipe from Food52, and as with Food52 recipes, it did not disappoint. It was a pretty easy bread to make (no yeast is helpful), so I highly recommend trying it! Preheat the over to 375 F.
Using some extra butter, grease a round ceramic/glass baking dish or a metal cake pan (but not a dark metal one — it will cook the bread unevenly). Dust the dish with flour (scatter some in, then turn the dish over the sink and tap out any excess). Whisk buttermilk and eggs together with a fork. Add baking soda and whisk just to combine. In a separate, large bowl, whisk together flour, baking powder, sugar, and salt. Add butter chunks to flour mix. Cut the butter into the flour — you can use a pastry cutter, or criss-cross two table knives on either side of the bowl and cut through the mixture. Cut until there are just little visible bits of butter in the flour. This diagram will hopefully help! You’ll be amazed to hear I haven’t taken a drawing class since 8th grade! 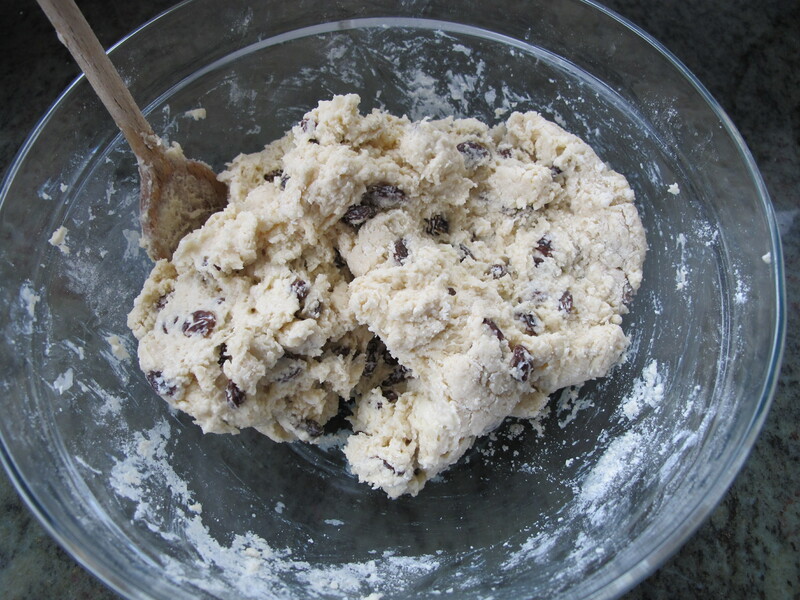 Stir in raisins to flour mixture. Make a well in the center of the mixture. Pour 1 cup of the buttermilk mix into the well. 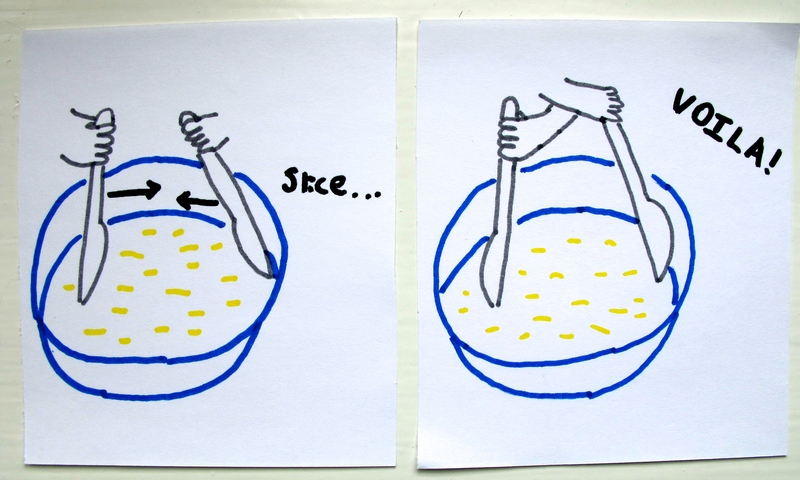 Stir gently with a wooden spoon. Using a spatula, fold the remaining dry flour from the sides and the bottom into the wetter dough in the center. Throw some flour on your hands and shape the dough into a ball, without handling it too much. 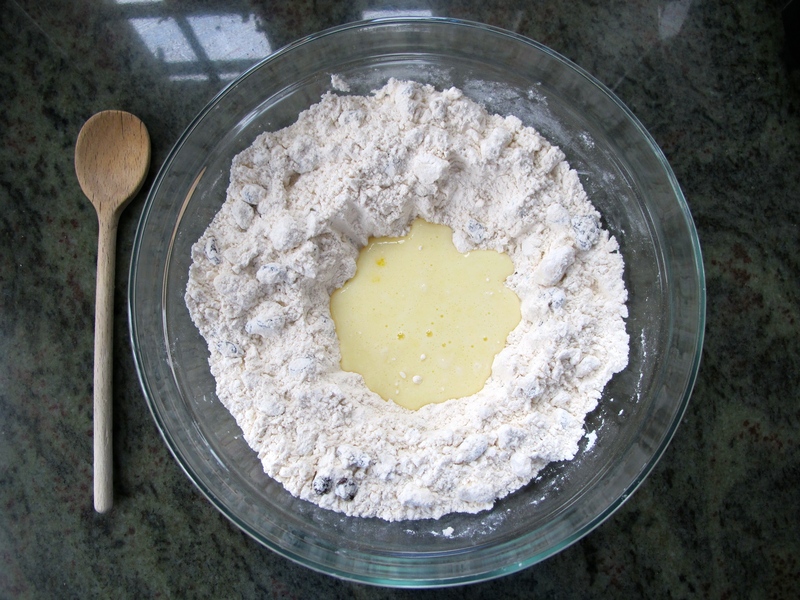 Put the dough into the baking dish, and spread it to the edges with a wooden spoon (using as few strokes as possible). Make a cross on top of the dough with either your finger or the wooden spoon. Sprinkle a little flour on top. Bake for 40-45 minutes. You can check that the bread is ready by putting a knife through the center of the bread — no wet dough should come out on the knife. Cool in the baking dish for 10 minutes, then transfer to a baking rack and cool completely before eating! This entry was posted in Noms and tagged Bread, Food52, Irish soda bread. Bookmark the permalink. Enter your email address to follow Sips and Noms - you'll receive notifications of new posts by email. From the last day of French Quarter Fest on Sunday. Did I get powdered sugar all over my jeans? Yes. Was if worth it? Always.